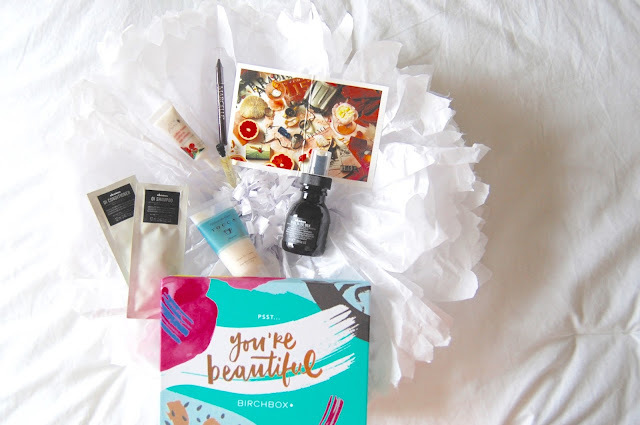 I know I briefly referenced my Birchbox last month on my five things post, but I didn't really explain my excitement for essentially getting a new package in the mail each month. It was given to me as a birthday gift from one of my best friends who knows my passion for trying new things and being able to experiment with different products so I can find my go-to. My first set was filled with necessities for the end of summer-- like my R+Co Death Valley dry shampoo (which I'm kind of obsessed with & can be purchased at Neiman Marcus for $29). Yesterday, I received my second box which was stocked up with lots of skin & hair products (perfect since I'm on that kind of kick right now) + a deep purple eye liner (again, perfect for my green eyes). 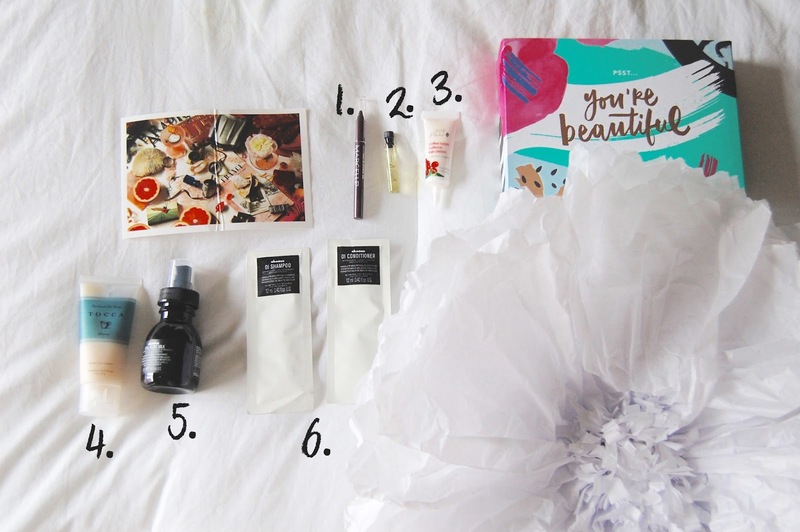 I was able to toy around with each one of my goodies yesterday because I had a late start to work, so here are my somewhat obsessed reviews of each thing that came in the cutest "you're beautiful" box. 1. Marcelle Waterproof Eyeliner in Mulberry $11 : I love bright eyeliners, but this one stood out to me because it's waterproof! Unfortunately, I always have a problem with eyeliners that smudge, but this one stays put! Blood, sweat, and tears. 2. Atelier Cologne Pomelo Paradis $110: Not too long ago I was looking for new fragrances to add to my collection. I took some of the suggestions I was given, but once I smelled this perfume by Atelier, I knew that I.must.have.it. From someone who is well traveled, I opened the sample and was transported to the different countries I have visited in my past. This scent has collected different flowers and plants from across the world and stuck them in a bottle (Morocco, Tuscany, China) and is totally romantic. If romanticism had a smell, it would be this perfume. 3. 100% Pure Organic Coffee Bean Caffeine Eye Cream $25: My eyes shifted immediately to this product once I opened my box. I have a big HUGE problem with bags under my eyes (thanks, dad!) and on days that I'm extremely tired, I feel as if I need to drink 20 cups of coffee to feel remotely alive. This cream is almost equivalent to putting tea bags on your eyes, but even stronger because of the substitution of coffee. 4. Tocca Esfoliante da Corpo Nourishing Body Scrub $32: A lemon green tea body scrub that has an irresistible scent. Literally, I used some on my hands and couldn't stop smelling them. I've always been a fan of sugar scrubs because of the way they make my hands feel once I finish, but seriously this smell is addicting. 5. Davines Oi All in One Milk $30: So, I've already used this once, but I feel like it's not enough for me to do a complete review on it. It's a leave in conditioning treatment that adds moisture and shine (which sometimes is unwanted for those of us who have fine hair...) BUT it protects it and promotes hair growth as well (which is what those of us with fine hair love!) I guess I'll have to finish the bottle first before I go on my ordering spree. 6. Davines Oi Shampoo & Conditioner $28//$34: Minty hair cleansing formulas but to be honest the samples are too small to determine whether or not I love them. From what I've already used, they seem like great products... but again it's hard to determine how reliable a shampoo or conditioner is until you use it over a period of time. You guys, these box sets are totally fun. And worth it.